In my Goodreads profile I describe myself as a serial reader and memoir enthusiast among other things, so it really surprised me I have never done a post solely devoted to them before. I am nearly always reading one. There's just something about reading other people's stories that I love. Granted, there's a bit of a theme, for the most part, to the stories I like but nonetheless I love most of them. Today I'm waxing lyrical on five memoirs I love. Some I've blogged on before, in fact I think most of them have been mentioned but it's a while since I talked about them. Rounding them up together means you have a handy list to refer to as well. Enjoy! Where Am I Now? by Mara Wilson-Out of all the essay collections I have read lately, Mara's is up there in all-time favourite category. There's just something incredibly pleasing about the way in which she writes. I cannot quite pinpoint it but she makes what might otherwise be an alienating book one that any reader can connect to. I've heard that the audiobook is fantastic as well so if you're into those you should give that a listen. 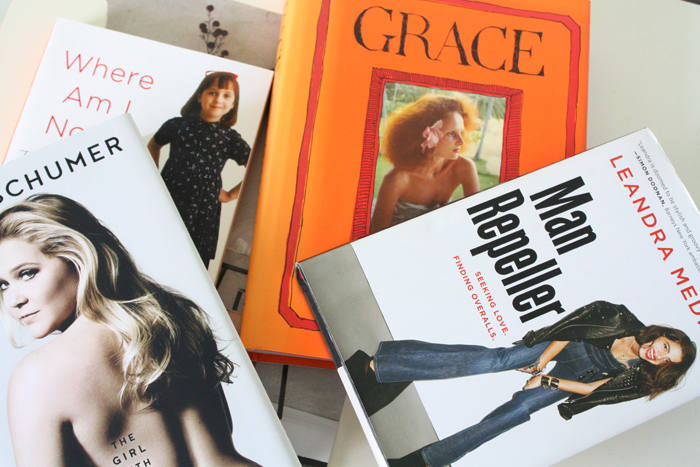 Grace: A Memoir by Grace Coddington-It's hard for me to say who is my favourite fashion director for Vogue. Between Coddington and Lucinda Chambers it's a very, very close tie. I'm re-reading Grace's book at the moment and love it. Illustrated with her charming pictures throughout and interwoven with imagery from her famed shoots, it's a stunning, inspiring read. Her insights into her creative process and the world of print magazines are so valuable. Man Repeller by Leandra Medine-To know me is to know I am never not obsessing over Leandra's writing. Expect Leandra's usual wit and brilliance as well as some truly brilliant stories. There's more to clothes than just fabric, it is often the memories and moments in time that make them truly personal and special to us and she really looks into that in this book. Highly recommend this if you are a fashion fan or a Man Repeller lover like me. The Glass Castle by Jeannette Walls, not pictured-This memoir by Jeannette Walls about her less than conventional childhood is so unreal, you really wish it was fiction. Her parents were both alcoholics and really led the family into a sorry state of affairs. There are moments in this book which had me in tears and just astounded at what Walls and her family had to endure. It really gives you a lot of perspective and while the book may be an uncomfortable read, it did leave me squirming at times, it's well worth it. There's a film adaptation being released at some point this year too I believe, starring Brie Larson, Max Greenfield and Naomi Watts among others. -What memoir have you read and liked?